Sorry, Chinese Patriarch Ancestral Painting on Linen or Silk and Professionally Framed is not currently available. Chinese ancestral painting of three officials on paper is striking with its bold colors. 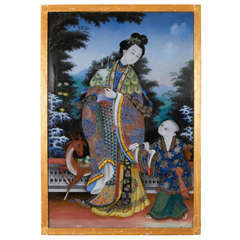 It is displayed in a carved rosewood frame and protected with plexiglass. Antique Chinese export mourning reverse painting on glass, depicting seated mother with weeping child, in period giltwood frame. Measures: 9.5" x 11.5" W 12.75" x 14.75" framed.